Walnut Creek Park is located in southern Albemarle County, Virginia, and is run by the Albemarle County Parks and Recreation Department The park is surrounded by mountainous terrain, and includes open fields and the beautiful spring-fed Walnut Creek Lake. The park offers many experiences for outdoor recreation including: swimming beach and pavilion, fishing, mountain biking, hiking, canoeing, disc golf, picnic shelters with BBQ and plenty of parking. This course was the club's first course built in 2002, with continual improvements made each year. Albemarle County offers $25 off the cost of either an individual or family pass to the park. The Walnut Creek booth has a list of current BRDGC members, or simply show them the bag tag. Hours: The park is open from 7am to sunset throughout the year. Admission is charged at the main gate during swimming season. An attendant is available at the gate and lifeguards are on duty from Memorial Day through Labor Day. The price of admission includes full use of park facilities for the day. All other times are FREE! Season passes are available at a discount to BRDGC members. The Greene County Community Park is located in Greene County, Virginia, and is run by the Greene County Parks and Recreation Department This beautiful course offers a variety of holes through fields, woods, and over water. The park offers many experiences for outdoor recreation including playground, walking trails, soccer fields, a picnic shelter, restroom facilities, and plenty of parking. 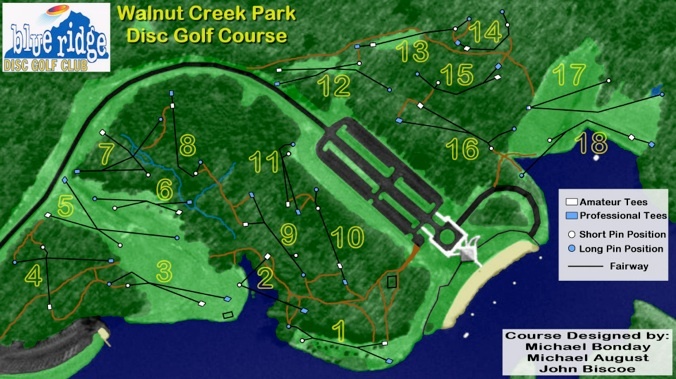 The original course built in 2004 and current course was redesigned in 2010. In 2012, the club added artificial turf-covered tees. Hours: The park is open from dawn to dusk. 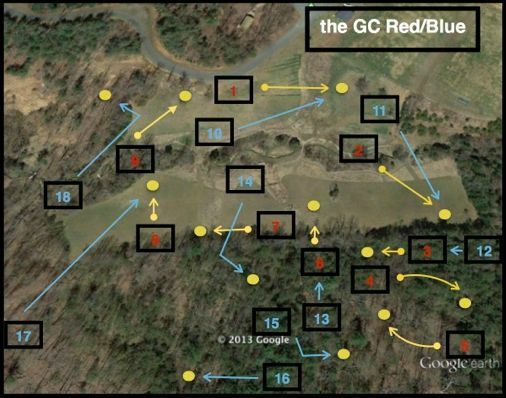 The Blue Ridge Disc Golf Club completed a new 9-hole course in August 2015. The course is built on land behind the English Inn next to community gardens and along the Rivanna Trail (RTF). The BRDGC has been working in cooperation with the Charlottesville Parks & Recreation Department, and appreciate all their support to bring this sport to the City of Charlottesville. Hours: The park is open during daylight hours. Parking: Small gravel lots next to Tee #1 and around the corner next the garden plots. Please do not park on grass across from Tee #1 as land belongs to The English Inn.